Our confidence level on this rumor is 9/10. As with our last 9/10 rumor, a point is only deducted because this is a pre-release feature without official acknowledgment. A source familiar with future Search plans has indicated that this feature is coming, and code found in a recent Search update corroborates that information. As stated above though, unreleased features can change or disappear completely before making it to prime time. As with our previous two Now-related rumors, this one is very simple - Google Now will (according to a source familiar with the matter) remind you of upcoming bills, provide helpful information, and give you a quick link to pay the bill online. According to our information, the reminders could include bills for things like utilities, cell providers, credit accounts, and possibly others. 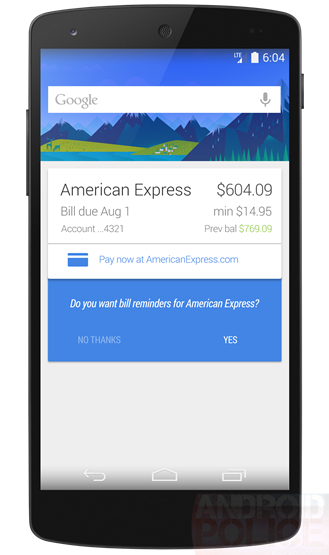 It will apparently do this with a card like the one seen in "The Evidence" below, asking users if they want reminders for a given bill. If so, a card displaying the amount due, minimum payment (if applicable) and other information will hang out in your Search app until action is taken. Your bills will also likely show up in search results (only visible to you) when you ask Google things like "what is my next bill?" 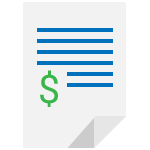 All bills may also be viewable in a single list. Based on available information, we've created the mockup below. This is not a source image, but judging from information made available by our source, and pieces of code in Search 3.3, we believe this is what Bill cards will look like. Cards that remind you to pay bills and surface all the relevant info you'll need certainly seem very helpful. That said, billing information can be sensitive. If our information is to be believed, account numbers would be partially obscured, but with this feature activated, you might want to keep a lock on your device's screen.